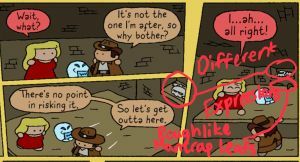 In Spelunky, taking the crystal skull causes the ghost to attack immediately. In Tastes Like Spelunky, taking Ghost Chef's Special Roasted Turkey has the same effect. The turkey replaces the crystal skull. It's Ghost Chef's specialty. Speaking of Tastes Like Spelunky, are you going to do an HD version of Tastes Like Spelunky? I'm tempted to add some of HD's features to TLS, but I can't make a real version. To make Spelunky mods, you need Game Maker and the source code (which is free). The HD version is something else entirely. If the picture's appropriate for a general audience, I don't mind. It’s okay, just show the picture by putting it in your Stash. I'm not sure what you mean. What do you want a picture of, exactly? A picture of the software you use to make the mod. Sorry if I confuse you a lot. Game Maker. It has to be bought, though. Wut ghosts can celebrate thanksgiving? Some ghosts just have a passion for cooking. No occasion needed! Where the turkeys are TO DIE FOR. Hero made a smart move in avoiding that crystal skull not only because of the ghost. This story's fine without the addition of aliens. There is a strong possibility that both the game and this comic contain something that may be construed as aliens. True words I tell ya.